The handset supports ZTE's patented Frame interactive Technology (FiT) that allows to make use the phone's frame to interact with the device. According to a new report, ZTE is planning to release a new flagship smartphone. Dubbed ZTE Nubia Z11, it will feature a 5.2-inch bezel-less display with WQHD (2560 x 1400 pixels) resolution as well as the recently launched 64-bit Qualcomm Snapdragon 820 SoC and Android 6.0 Marshmallow. The handset supports ZTE's patented Frame interactive Technology (FiT) that allows to make use the phone's frame to interact with the device. 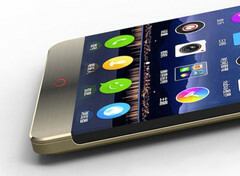 The technology had been first used in ZTE's Nubia Z9 smartphone back in May this year. It is expected that with Nubia 11, FiT might bring some new functionalisties. Another unique display technology used in Nubia Z11 will reportedly be the 'arc Refractive Construction (aRC). It allows to hide the edge of the display instead of using the frame for this purpose. Other specs include 4 GB of RAM and 128 GB of internal storage space (partly taken by the operating system), a fingerprint scanner on the rear of the device, as well as a 20.7 MP main camera with dual-tone LED flash and a 13 MP front-facing camera for selfies. The ZTE Nubia Z11 should hit the shelves in early 2016. Naturally, there is no pricing information available at this point.